See an example of a student Presentation ePortfolio at http://my.rcampus.com/studentx.W92689. Read How-to articles by a graduating student. To start building Presentation ePortfolios, visit RCampus ePortfolios. An ePortfolio (Electronic Portfolio) is a collection of your work (artifacts and reflections) in electronic format, which is managed by you and usually kept online. Students can use their ePortfolio as a record of their learning with evidence of achievements. 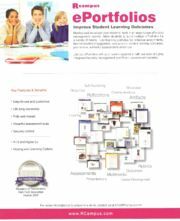 They can also build career ePortfolios to help them collect and manage artifacts related to their future career goals. Faculty ePortfolios usually include their curriculum vitae, areas of research, achievements, and any related artifacts. Multiple usages for different purposes: career, presentation, reflective, etc. Our ePortfolio System is a part of the RCampus platform. It can be used independently or integrated with existing systems, such as other learning platforms or Student Information Systems (SIS). If you have any questions or are interested in having our ePortfolio System for your institution, please contact us. Students can easily create multiple Showcasing ePortfolios for different purposes and submit them to their teachers/evaluators for feedback. Please go to Student ePortfolios for more information. Faculty can assign, collect and grade student Showcasing ePortfolios easily and quickly from their personal websites. Please go to ePortfolios for teaching for more information. More testimonials and case studies.